September 09, 2017. Helen Mirren is interviewed on the red carpet at the Toronto International Film Festival's premiere of "The Leisure Seeker". July 27, 2017. 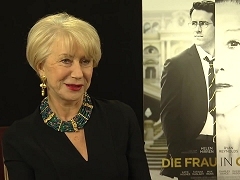 Helen Mirren is interviewed on France24 during the 57th Monte Carlo TV Festival about receiving a life achievement award for her contribution to television. May 26, 2017. 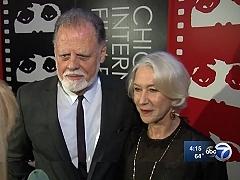 Report on the Chicago Film Festival honoring Helen Mirren and her husband Taylor Hackford with the festival's Gold Hugo Award. December 22, 2016. 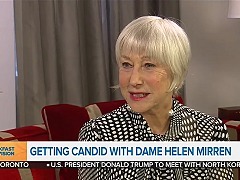 Helen Mirren visits Good Morning Britain to promote the theatrical release of "Collateral Beauty" in the United Kingdom. December 16, 2016. 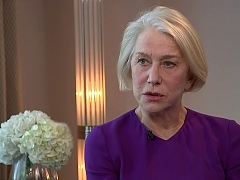 Helen Mirren talks to CBS2's Mary Calvi about "Collateral Beauty", her life and career. December 2016. 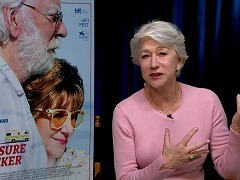 Actress Helen Mirren chats about her recent work, what it's like to be an older actress in Hollywood, and her films Collateral Beauty, and The Fate of the Furious. December 05, 2016. 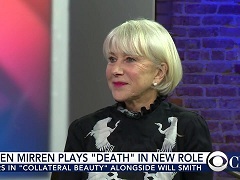 Dame Helen Mirren plays "death" in the upcoming film "Collateral Beauty." 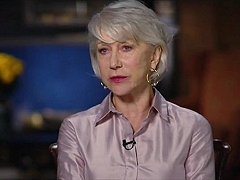 Mirren joins CBSN to discuss the role and her singular career as a stage and film actor. December 03, 2016. 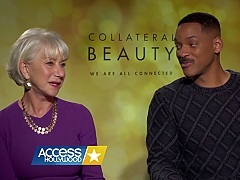 Press junket interview with Helen Mirren and Will Smith to promote the theatrical release of "Collateral Beauty". April 01, 2016. 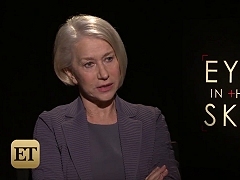 Report on the theatrical release of Eye in the Sky, including an interview with Helen Mirren. February 15, 2016. 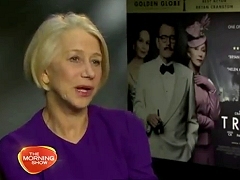 Helen Mirren is interviewed on The Morning Show to promote the theatrical release of Trumbo in the United Kingdom. February 03, 2016. 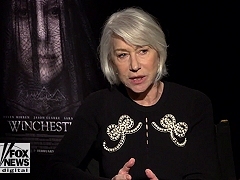 Helen Mirren talks about Eye in the Sky and remembers co-star Alan Rickman. February 02, 2016. 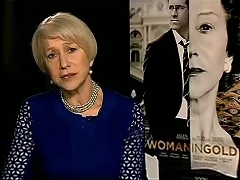 Channel 4 interviews Helen Mirren on the recent Trumbo, the Oscar controversy and American politics. February 02, 2016. 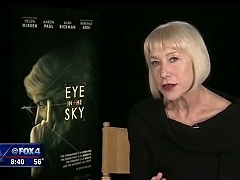 Helen Mirren is interviewed during the press junket for "Eye in the Sky".